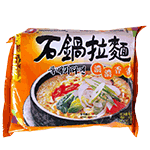 This Korean instant noodle is especially moist and tender with the clay-pot cooking method. The water absorbed in the clay is released as steam during the cooking process. Fresh and delicious, this Korean clay pot noodle is simply irresistible.